The Supreme Novices' Hurdle traditionally gets the Cheltenham Festival underway and bookmaker Ladbrokes is offering an enhanced price of 50/1 Getabird to win! Plus, you will get £5 free bet should he fail to win the opening race of the Cheltenham Festival! GETABIRD is unbeaten in his two hurdles starts to date, and he created a big impression when trouncing the high-class Mengli Khan in the recent Moscow Flyer Hurdle, coming home impressively by nine lengths from a small but talented field. If there is a negative it could be that all of Getabird's wins and completed starts have been when racing on right handed tracks. Claim this massively enhanced price in few simple steps, follow our instructions..
Join Ladbrokes via our special links and claim 50/1 for Getabird to win the Supreme Novices'! 3) Place a single bet of up to €/£1 on Getabird to win in the Supreme Novices Handicap Hurdle 2018 race winner market before the race starts. 4) If Getabird wins the race, your account will be credited with extra winning to make payout equivalent to enhanced odds within 24 hours. 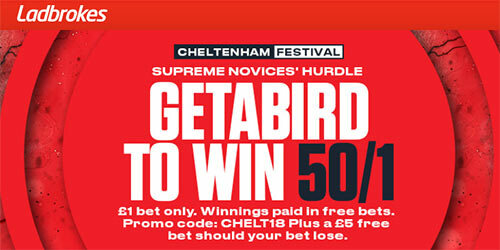 Ladbrokes offer 50/1 Getabird to win the Supreme Novices at Cheltenham + £5 if you lose! "Get 50/1 Getabird to win the Supreme Novices at Ladbrokes"